Yes it’s another zombie book review from me. Hey, I just can’t help myself, I love these zombie books. Some are terrifying, some are humorous and some, like this one, just make you think. Nearly every zombie movie and book has somewhere in it the saying about when Hell is full the dead shall walk the Earth, they may not quote it exactly but it seems to be a great explanation for a zombie apocalypse. It also provides a great excuse for religious zealots to appear in zombie movies. Either way I’m not waiting for Hell to fill up, I’m getting prepared for the zombie apocalypse now, and Max Brooks books (World War Z and The Zombie Survival Guide) seem to be great resources. This book tells of the Zombie Apocalypse and how all the nations of the Earth handled this horror show. Told in a series of interviews by the author, the apocalypse is reviewed from start to what may be the end. The interviews are with doctors, soldiers, the vice-president and other prominent political leaders. While this is a fun book with lots of pop-culture reference, it does, at times, seem like a slam toward government and bureaucracy. Due to the other conflicts in the world the army is not prepared for a horde of living dead that have no central command. At one point in the book a young Palestinian doesn’t believe the dead are rising and thinks it a trick of the Israelis. The war at first looks like it may be a total loss but when the president of the United States holds a U.N. meeting (or rather what is left of the U.N.) onboard the USS Saratoga he finally is able to get the world to band together to fight off the zombie horde in a fashion that will secure the world for the living. At first there are problems, with the thinking of zombies cannot survive the frozen north, many people migrate to colder climates for what they at first think is a simple camping trip, but once arriving and winter setting in, realizing they are not prepared, and when supplies run low, the people turn on each other. I have to tell you a bit about my journey into this full-cast production of the audiobook before I let you know how awesome this recording is. 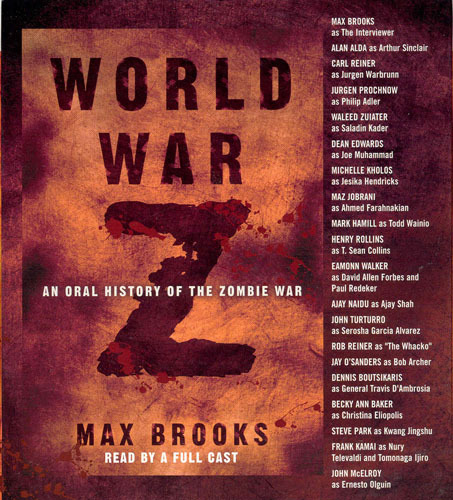 I knew I would be reading this book or listening to it, especially with my love of zombie books, but I was planning at first to read the “Zombie Survival Guide” by Brooks. But thanks to a few friends telling me how awesome this book was I decided to do this one first. I first checked out the unabriged version with a single reader and got through a few chapters of the book and was getting bored. The reader was doing a straight read and no acting, and this book really requires some acting involved. 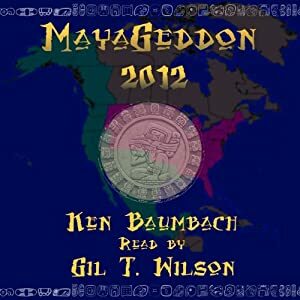 I was looking for information on the book while listening and found that a full cast version was recorded, albeit abriged. I don’t normally listen to or read abridged books, but when I saw some of the cast members of this book, I couldn’t resist. The cast includes; Alan Alda, Carl Reiner, Rob Reiner, John Torturro, Henry Rollins, and more. Just those names mentioned and I had to get this book. I mean, c’mon Hawkeye Pierce in a Zombie book? Let me tell you It was worth it and more. The actors were superb, of course, and the mult-cast made this book much more believable due to the many people “interviewed” in the book. It was a blast to hear this version and I never regretted the abridged version. The social commentary made a lot of sense especially the aspect of Hollywood stars and social elite being totally worthless, and Joe the Plumber or Joe the Carpenter becoming the most valuable of citizens in time of disaster. The interview with Henry Rollins’ character T. Sean Collins, a bodyguard to the rich, proves this point perfectly in this book. This book combines horror, social commentary, and some fun into a must read, or in this case listen, zombie book. From this book you’ll learn just how close the human race is to becoming extinct. Whether you are a fan of zombies or not, trust me you will enjoy this book, and as an added bonus, you’ll learn how to prepare for the zombie apocalypse. And now for the good news; There will be a movie made from this book. I can’t wait. I loved this book, now I might have to listen to it! If you haven’t yet, maybe also try Warm Bodies – I found it to be a unique twist on zombie books! I am really loving these short (1 hour or so) audio stories released by AudioGo. They are each like an episode of Doctor Who and the perfect filler while waiting for the next season of Doctor Who to come back to television. The BBC has just announced a new companion for the Doctor for the next season, so while I get even more antsy for the next season I have these audiobooks to fill my time. I believe this is the last short story I have for the 11th Doctor, so the next ones will be full-fledged audiobooks from AudioGo (they have lots from all the Doctors). This “episode” begins with a patient, Clint, who has had dreams of abductions talking to a doctor, but as it turns out it is The Doctor. The Doctor, Amy and Rory have landed the TARDIS in Pennsylvania but on November 9th, 1965 have taken a train to New York to find a cure for a poison that is in the water, and Clint seems to be a key. Rory and Amy have caused a fireplug to overpressurize and in turn the water spray reveals a ship floating above New York City. Soon people start freezing and exploding and it is up to the Doctor to find the cure for the poisoning. The aliens cause a blackout which makes things difficult for the Doctor to get a message, or rather a warning, to the aliens, but assisted by his trusty sonic screwdriver the Doctor fights on. The reader, Stuart Milligan, did a very nice job creating the all around feel of a Doctor Who story. The writing was a perfect fit into the world of Doctor Who and, Milligan was able to bring to life the action and emotion of the story. His voicework was very good when representing the Doctor, Rory and even Amy, however his representation of Clint seemed a bit forced, I think he was trying to go for a typical rough New York cab driver with the voice, but it didn’t seem to work for me. The rest of the voice work was nearly perfect. In case you aren’t familiar, Milligan portrayed Nixon in the “Impossible Astronaut” episode of the program. 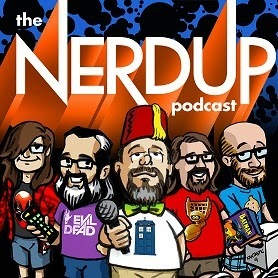 Definitely a must listen for any Doctor Who fan. Nothing you couldn’t go without, but definitely a story for filling in some of the time before the new season. First and foremost I have to admit I am a Kevin Smith Fanboy, but even more so now. Although I don’t think I can call myself a full-fledged Fanboy since I don’t listen to his Smodcasts. I’ll explain Smodcasts later. I really should listen to them, but I listen to so many audiobooks that I have a hard time finding a place to squeeze them in. Okay, okay, I will start listening…one smodcast between each book, fine, are you happy, Mr. Smith? 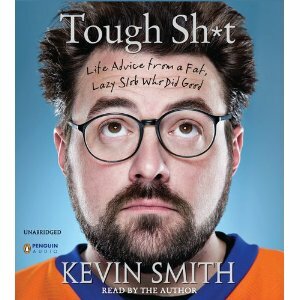 Anyway, back to this book, Kevin Smith, to many folks is that “Clerks” guy, or maybe the “Chasing Amy” guy, or maybe “the Too Fat to Fly” guy, or more recently the “Comic Book Men” Guy. No matter what your association with Kevin Smith you know it’s a lot of humor, usually self-deprecating, and even some bouts of reality thrown in at a super-sized delivery box. (sorry could help the fat joke, but being a fat lazy slob as well, I can do that.) Kevin Smith was king of the indie films (and still is in my book) during the 90s, beginning with the movie “Clerks,” a tale of two slackers hanging out at a convenience store and their obsessions with pop culture (particularly Star Wars). Okay actually it was a lot more than just that but I’m not reviewing that movie at this moment. Smith, had the dream to become a filmmaker and sought out that dream. Soon his movie was sold to Miramax and the entire Jay and Silent Bob run of movies began. Jay and Silent Bob seemed to be anchors in all his movies, with Silent Bob being played by Kevin Smith. During his filmmaking career, Smith created a whole new genre of films that would soon be copied and become a staple in summer movies, the Bromance. Kevin’s films showed that men can interact with each other and that the movie can exist entirely on the basis of a friendship between two guys. With “Clerks” & “Clerks 2” there was Dante & Hicks and in an odd way, Jay & Silent Bob. The Bromance film would later be copied in such films as “Good Will Hunting” (no he didn’t help write that one, which he talks about that controversy in this book), “The 40 Year old Virgin,” “Superbad” and “Pineapple Express.” the last three you’ll notice were Seth Rogen films, he comes up in this autobiography a few times. So making Indie films was the beginning and soon Kevin was sucked into the corporate world of Hollywood. At one point he got to meet his big screen idol, Bruce Willis. While working with Bruce he found him to be a decent guy, but when Kevin was called on to direct Willis, Smith found out that Bruce was a “douchebag” (his word not mine, I don’t know Bruce Willis, but I, like Kevin Smith, am a fan of his work). This one of the many events Smith talks about in “Tough Sh*t” that begins to make his passion of filmmaking actually work, and begins his journey to seek out something else to keep his mind creative. On a good note, Kevin Smith says that the line “You should never meet your heroes.” should be changed to “You should never meet your heroes, unless the hero is George Carlin.” Kevin Smith grew up appreciating and loving Carlin’s ability to talk smart, using the English language in a very intelligent way while still sprinkling in some colorful expletives to grab the attention of the audience. When he met with Carlin he discovered that Carlin was the genuine article, and a down to earth Human being. All of these stories are included in “Tough Sh*t” and more. The biggest lessons Kevin learned and shares with the listener/reader of “Tough Sh*t” are from “The Great One,” Wayne Gretzky. Kevin watched a series on hockey and learned from “The Great One” two major lessons: Gretzky was great because of assists not just because of the high number of goals scored and don’t be where the puck has been be where the puck is going to be. Throughout this book Kevin talks about how he has applied these lessons to his life. This peek into the world of Kevin Smith screams with subtlety, what makes the man Kevin Smith. From his respect for his dad who died screaming to his beautiful wife and daughter, Smith turns out to be a pretty darn decent human being. He’s the type of guy that if he were your friend, you’d have a friend for life. Kevin Smith is able to tell his story in the fashion of his hero, George Carlin. Speaking intelligently and with lots of wit and a sprinkling of what could be “offensive” language. From stories of helping his friends to adoring his wife, I feel after reading this book I know the man personally. I wish…but for now I’m happy being a Kevin Smith Fanboy. I’m not a huge fan of Smiths films (I did like Red State) but I am a big fan of him as a person and I regularly listen to his smodcast and it’s absolutely hilarious. Great post. This books made me laugh so much. I would never call myself a Kevin Smith fan. I’ve been more of a Kevin Smith appreciator. Anytime I saw something by him or with him in it, I always enjoyed it, but I never went out seeking his stuff. It was really nice to get in his head though. He’s one smart guy. I think the what I liked most is that just as he was almost swept up in the corporate biz of Hollywood, he went back to his indie roots keeping his sense of humor and individuality. Absolutely, I would expect no less from him. 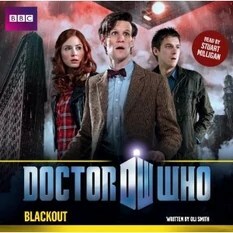 First of all I want to scream out how much I love the BBC and AudioGo for making these Doctor Who audiobooks available. I am antsy and eagerly awaiting the next season of Doctor Who and in the meantime I’m getting my fix of the Doctor, by listening to these adventures through time and space with the 11th doctor. When I run out of the 11th doctor I will go back to the 10th (who, portrayed by David Tenant, was my second favorite Doctor to Tom Baker) But these adventures with the 11th Doctor (portrayed by Matt Smith) are loads of fun. Right now I’m going through all the audio releases that are three hours or less, and having a blast. This audio release is read by Meera Syal, who appeared in two episodes of Doctor Who; The Hungry Earth Cold Blood. She portrayed Dr. Nasreen Chaudhry, a geologist in the year 2020. Along with Tony Mack, she was digging down into the Earth further than any other human ever had before. They discover a race of reptilians that have lived under the Earth for years and will do so for many more. Anyway, at first I was wondering if her reading this book would mean that her character would make an appearance in this story, and reading the cover notes I couldn’t see how. As I listened I realized she wouldn’t, but Meera did a superb job in reading the story. She was able to capture the quirks of the 11th Doctor and Amy Pond perfectly and with the help of the subtle music score was able to present the emotions and excitement throughout the story. The story follows the The Doctor and Amy as they arrive on the ice-planet Vinsk in the year 2112. Where the Zalnex company is getting ready to release a miracle hand lotion. The lotion provides the user to understand all languages. The problem, the shipment is being sent to Earth and the lotion was never tested on humans. As it turns out humans are susceptible to insanity after using the hand lotion, because the human brain cannot sort out the languages at once. The doctor that created the lotion cloned a race called “Meme Spawn” and used them to manufacture the lotion, by introducing the microscopic spawn into the lotion where they psychically link to the host allowing the host to understand the languages. To make things worse the cloned Meme Spawn, are able to mutate and become a sort of flying starfish creature and conquer the hosts. The Doctor and Amy race against time to keep the shipment arriving on earth. But along the way Amy becomes “infected” and the Doctor must make the decision of whether to save Amy or the Human Race. This romp through space and time is just as fun as any episode of Doctor Who and sorts itself out in true Doctor Who fashion. Full-cast performance featuring: Josh Clark, Shannon Cochran, Dane DeHaan, Arye Gross, Kenneth Houston and Kate Rylie. Being a fan of theatre, I get a little anxious when I see coming up on my reading list something from L.A. Theatre works. I think even more so when it is a contemporary play such as this one. By the way, Yes, I make a list of books to read. The production quality behind L.A. Theatre Works’ releases is always high, which is why I look forward to these audio theatre performances. The casts of all their works are perfect, but what makes it even more entertaining, is that while these are plays for viewing L.A. Theatre Works takes the time to produce these into great audio drama. The sound effects, music, and acting all place the listener into the middle of the audience. 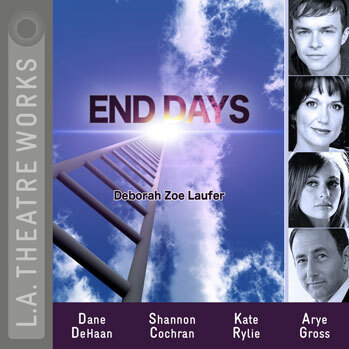 This time around the play “End Days,” came up on my list and I wasn’t sure what to think. Reading the synopsis on the L.A. Theatre Works website (http://www.latw.org )gave me a good idea. “In Deborah Zoe Laufer s End Days, a suburban family is undergoing a spiritual crisis following the September 11th attacks. Sylvia Stein has turned to Christianity to save her disaffected husband Arthur and her rebellious teenage daughter Rachel. But as Sylvia races around preparing for the Rapture, Rachel is learning that there are more things in Heaven and Earth than are dreamt of in her philosophy.” The performance also includes an interview with physicist and theologian Robert John Russell (Center for Theology and the Natural Sciences). Science and Religion both represented in one play? I knew there was going to be some sort of clash and then a ripping apart of the very fabric of reality. But no, that wasn’t quite it. To look at this play you have to first examine the quirks of each of the main characters. First off we have Nelson Steinburg who lost both his parents. His mother was a big fan of Elvis and one year for halloween he dressed as Elvis and his mother loved it. At her funeral and ever since he has dressed as Elvis. This strange way of dressing gets him beat up a lot in school, but Nelson is so optimistic about life that it doesn’t bother him. With his new “Step-Parents” he is converting to Judaism and is getting ready for his Bar Mitzvah and memorizing sections of the Torah. He has also become infatuated with the new neighbor, Rachel Stein. He gives her a copy of the Stephen Hawking book “A Brief History of Time,” telling her it will changer her life. Nelson is not only uber optimistic, he is also eager to please everyone. Rachel Stein is the daughter of Sylvia and Arthur Stein. The Stein family has recently uprooted and fled Manhatten after the events of 9/11. The family has all been devastated by the tragedy and have coped with the devastation in their own way. Rachel has become a bit anti-social and Goth. But when she read’s the Hawking book, she soon starts getting spiritual guidance from an etherial Stephen Hawking. Sylvia Stein has decided to take Jesus into her life, maybe more than that, she seems to have conversations with Jesus every moment in her life. He even offers her sweetener when she’s having coffe, “yes, thank you, Jesus.” To which Jesus replies, “You’re welcome, I love you.” Sylvia has taken it upon herself to have everyone in the world know Jesus. She hands out pamphlets all day, and holds prayer vigils. When Jesus comes to her in a dream and let’s her know the Rapture is coming, she does everything she can to make sure her family is taken in the Rapture. Arthur Stein was in the World Trade Center on September 11, 2001 and was the only person in his company to escape and survive. Since leaving Manhatten has never left the house, even worse he has never even gotten out of his pajamas. He lives life only to nap and suffer his own depression. And with all the family members coping in their own way he only sinks deeper. Nelson is the catalyst which stirs up the whole family and gets them on the path to healing and feeling. He confesses his love for Rachel to Arthur, even if he’s only known her a couple of days. Eventually he convinces Arthur to get dressed and go to the store when Rachel gets upset about never having any food in the house. Rachel wants cereal and only Nelson can save this crisis. Not knowing what kind of cereal his own daughter likes, Arthur is convinced by Nelson to buy one of each. Nelson also shows Rachel that Science is a great way to finding answers to everything and that even if you don’t find the answers it’s the questioning that will lead you to the right path. Sylvia is convinced the Rapture is Wednesday and insists that all the family stay together that day and pray. Nelson even offers to make the dip and the family, including Nelson, prepare for the Rapture. This play is one of the most uplifting performances I’ve heard in a long time. Everything from helping the depressed, finding truth, and even questioning life is included in this performance. While listening to this performance I ran the gamut of emotions, a bit of sadness, elation, pure joy. Each one of these included outbursts that I’m glad I was alone while listening, anyone seeing me go through these emotions in such a short period would have probably thought I was a bit unstable. But the writing and the performance in this kept me alert and at the end I was emotionally cleansed. Another month flies by and it’s time for another release of a story from the golden age from Galaxy Audio/Galaxy Press. 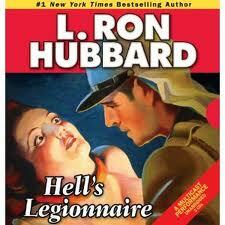 In April (2012) they will be releasing the L. Ron Hubbard far-flung adventure “Hell’s Legionnaire,” featuring three stories from the days of pulp fiction magazines. The three stories in this new release were all released in 1935 and each one tells a tale from the adventures of the French Foreign Legion. I remember when I was a kid and seeing on television some kid threatened to run away and join the foreign legion. I became intrigued and looked up the info at the time and realized that while I liked the kepi (the cap worn by the Legion) and the exploding fleur-de-lis symbol, I was not about to follow the kid on television and become an elite fighting force which allowed all nationalities a chance to fight for France. However, Hubbard has written several stories involving the Legion I can live out these adventures, even if only in my imagination. Once again Galaxy Audio has produced an audiobook that not only brings to life these classic tales from the master story-teller, L. Ron Hubbard, but also recreates the whole pulp-fiction experience into an audio format. They achieve this by creating a performance of the book that is very reminiscent of old-time radio shows from around the same time of the original printings of these stories. The voices, from the separate actors for each character all the way to the classic old timey feel of the narration keep the story realistic and yet over the top with each performance. The sound effects place the listener right in the middle of the shootouts between the Legion and the Berbers. The music between chapters and stories is superb and with the bugle calls of the Legionnaires as the building point for the original music, the listener can charge along and fight the Berbers or seek out the gold. “Hell’s Legionnaire” originally published in the July, 1935 issue of “Mystery Adventures” tells the tale of an american who is sentenced to a penal colony for killing an officer, even though it was self-defense, as he runs from the Legion but only to find he’s run straight into a Berber camp, the enemy. In this camp he discovers a beautiful American woman who is just about to be tortured by the Berbers. He can’t just leave her behind so using his cunning and skills learned in the Legion he fights to find away for them both to leave the country, while trying to not only escape the Berbers but the French Foreign Legion, as well. “The Barbarians” originally published in the December, 1935 issue of “Dime Adventure Magazine” tells of Captain Jack Harvey, an American in service of the Legion who is sent to avenge the death of a comrade. He flies behind enemy lines to confront the Berber tribal chief and after talking with the chief sees the war in an entirely new philosophical view. “The Squad That Never Came Back” originally published in the May, 1935 issue of “Thrilling Adventures” tells of a corporal in the Legion who, threatened with death, leads a group of fellow legionnaires to a lost treasure in the Moroccan desert. Each story is a great escapism story that will give you the chance for some great adventure while staying within your own comfort zone. Once again I’m amazed at the range of Young Adult fiction genres available. This time around I was just looking for another zombie book to listen to, and I had heard one of Maberry’s other books (actually a couple of them) and his writing was so creative I thought, well, it’s about zombies and it’s by Jonathan Maberry, so I can’t go wrong. Nope, I didn’t go wrong, the story was fantastic, but what surprised me was that this was released as a Young Reader’s fiction, or rather it was written, as a Young Reader’s book. Really, how cool is that, a zombie book with a bit of a coming of age story? One of the things I like about MOST Young Adult fiction, is that they usually offer up some sort of life-lesson which the main character learns and matures as the book progresses. Throw in a Zombie Apocalypse, and boom, you know kids would love this book. At least I hope so, because, sure, while it is a coming-of-age/life-lesson book, there are some super cool zombie massacre scenes, and some cool samurai swordplay that totally rocks this story. Props definitely have to be given to Brian Hutchison on the reading of this book, with the variety of characters providing dialogue, he did a superb job of vocally separating each character from the main characters, brothers, Benny and Tom Imura, to the various rough and tumble zombie bounty hunters, like Harry Pink-eye and the Makong brothers. He also knew exactly when to emphasize the action and slow down for the moments when something serious was being discussed, keeping the focus on the story and the creative way of telling a coming-of-age story. The story begins about 13 years after “First Night,” the night when the dead began to rise and feed upon the living. The world has changed, the zombies still walk out side towns protective walls in what is now known as “The Rot & Ruin.” Benny Imura has turned 15 and that being the age where he must find a job in order to keep getting rations, he searches out several avenues. Most people are surprised he’s not becoming a bounty hunter like his brother. Benny doesn’t care for his brother, Tom. Benny thinks Tom is a coward because of his first memory. That memory takes place on “First Night” where Benny’s mom hands Benny to Tom and Tom runs away carrying Benny as their father kills Benny’s mom. I should point out that Benny and Tom are Half Brothers. Benny searches for a job all over Mountainside, the fenced in community where many have settled, so he can keep his rations. He tries for the job as an erosion artist, artists that take pictures of the formerly living and turns them into zombies so bounty hunters can bring closure to the families (at least SOME bounty hunters). Benny makes the zoms too scary so that job is denied him. Seeing an ad for a bottler, Benny thinks cool, bottling soda, that should be great, but as it turns out that soda is not being bottled, instead, Cadaverine is being bottled. Cadaverine is the “essence” of the dead that keeps the zombies from attacking the hunters who go out into the rot and ruin. All through Benny’s job searches, more and more is learned about this post zombie apocalypse world, and Benny finally thinks it would be cool to be a bounty hunter. After all he hangs out at the local store hearing tales of expeditions from the roughest of all bounty hunters, Harry Pink-eye. Benny can’t figure why everyone is always saying his brother is the best of all bounty hunters, when Harry seems to have all the greatest stories about the Rot & Ruin. Tom takes Benny out to try to show him what a bounty hunter really does and changes Benny’s view of the world. Tom shows Benny that he kills zombies only to bring closure to grieving families, so they finally know what happened to lost loved ones. Seeing a new side of Tom, Benny’s world begins to change. In this strange zombie world, the kids all collect zombie cards, cards that depict great moments of the world since First Night, and the heroes and bounty hunters. When the latest release of zombie cards comes out and features a rare card featuring the “Lost Girl,” Benny becomes intrigued. The story is she was left alone to fend for herself in the Rot & Ruin, and is still alive killing zombies. Benny finds out that there is more to the story one that involves his brother and some bounty hunters that create extra-curricular activities by forcing men women and children to fight zombies in an arena. Benny and Tom’s worlds are destroyed when the card comes out because the bounty hunters don’t want the world to know about the “Lost Girl” and they kidnap Benny’s friend and head out to find the “Lost Girl,” leaving Benny and Tom on a race against time and zombies to save the innocents. Super exciting zombie story with some great life-lessons, give this one a go. Trust me, you’ll be glad you did. 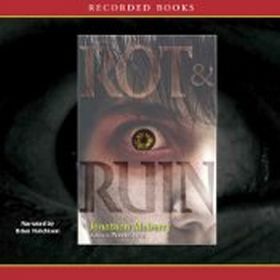 I love Rot & Ruin, but I really never jelled with the narration for this one. Not that Hutchinson was bad, because he wanted, but he sounded to old for the characters in my opinion and that took me out of the story. I’ve been trying to decide whether to read the next installment of do the audiobook version. granted he was older sounding, and that worked for the narration and the many adults and when it came to voicing the 15 year old voices (the youngest of the book) he captured the feel and sound, in my humble opinion. Okay first of all I want to apologize for the time between reviews, this time around I have picked 2 long audiobooks and one extremely long printed book. But soon I’ll be back on track. They have all been worth it, especially squeezing in this 6 hour fun journey into the future. I knew this was the right book to be listening to, right now, because of the subject matter and the side stories created. First of all this book is a nice piece of classic science-fiction that involves time travel and immortality. So right there you know this is going to be interesting. But the book also involves ghosts, spirits, the afterworld, hauntings, and zombies. The cool part of this was that, of the other books I was reading or hearing at the time, one was a zombie book, one was a time travel book and then there’s this one. As for the ghosts, well, in case you didn’t know it I’m also a paranormal investigator with a local group (on facebook http://www.facebook.com/psiofi ) and one of the side ventures I was doing that may have helped to delay this book was a little ghost hunting on the side, so all the subjects covered in this were fitting in with all my other projects. “Immortality, Inc.” was first published in 1959 and gave a bit of a grim look at humanity’s future. Sheckley’s unsettling vision of the future is told in a bit of a witty sort of way so as not to be one of those depressing dystopian novels, like “1984” or “A Brave New World,” I loved those books, but every time I read them I get just a bit depressed. This book however had some fun moments. In fact there is one moment in the book that is so humorous it was represented in the animated series “Futurama.” The moment is when the main character, Tom Blaine, finds himself transplanted from the year 1958 to the year 2110 and in trying to escape the hustle and bustle of the city of the future, finds himself in line for a suicide booth. This story was said to be the basis of the 1992 film “Freejack,” starring Emilio Esteves and Mick Jagger. But from what I remember of the film, Hollywood took some creative license and mucked around with the story quite a bit. I’m going to have to rent that again and compare sometime soon. Before I get into the meat and potatoes of this intriguing and thought provoking sci-fi piece of art, I need to first talk about the reader. Bronson Pinchot is the reader, and after listening to the whole book, I have to say he does a superb job. I will admit that starting out the story I was worried because he seemed to be delivering the story in a very dry manner, but looking back that worked for the intro. As the story progressed and the characters started making their appearance, Pinchot shined. His ability to create voices for the separate characters was stunning. 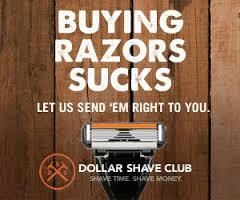 In some cases it was quite comical and worked perfectly with the humor written into the story. My favorite was his representation of a sleazy “transplant” street seller. Transplant is the ability to place your mind into any other body (and it doesn’t necessarily have to be human) and the salesman was like the combination of a pimp and one of those old trench coat wearing counterfeit watch sellers, and the picture i got while he voiced the guy almost made me feel slimy listening. Bravo! So, what’s this story about anyway? Well, Tom Blaine dies in a car crash in 1958 only to wake up alive in the year 2011. The Rex Corporation has taken Tom’s essence, soul, spirit from the past and put it into a “donated” body. The breakthrough of time travel is not new, but this form of transplanting the soul through time is new. They plan on using Tom as their poster-child for the process, until they learn the Government won’t allow this process. So they shut down all the plans to use Tom. He is released from Rex Corporation and goes out to explore the world in his new body. Maria Thorn, a representative from Rex Corporation soon rescues Tom from a body snatcher and helps him to properly view life. Body Snatchers take young healthy bodies (people) and kill them to allow the older rich people to reincarnate into them. The rich can do this legally but the illegal bodies are usually healthier and easier to come by. In fact, one of the doctors that brought Blaine over to 2110, is about to be reincarnated into a young body, but something goes wrong and the doctor is pushed out in the process by another spirit. The other spirit takes too much time acquiring the new body and becomes what is known in the year 2110 as a zombie. A zombie is a spirit that inhabits a body but the body is still dead and decaying fast. This zombie soon starts following Tom around, because he has some tie to Tom but cannot fulfill his mission until he remembers what that is. The zombie population help Tom escape when Tom is placed on a wanted list, but the threat of the one zombie still lingers. Tom is soon hunted down and after receiving conditioning to be able to make the journey into the afterlife, by being gifted with hereafter insurance, the Rex Corporation wants to kill him to cover up their crime of saving a soul without prior written consent. Tom then has to travel the world to escape the hunting squads and to find what the purpose of the zombie’s constant companionship. A story about man’s future and how even after finding there is an afterlife, humanity finds a way to ruin that. Some funny moments and even some nice thrilling moments. This should be added to any true sci-fi fan’s library. 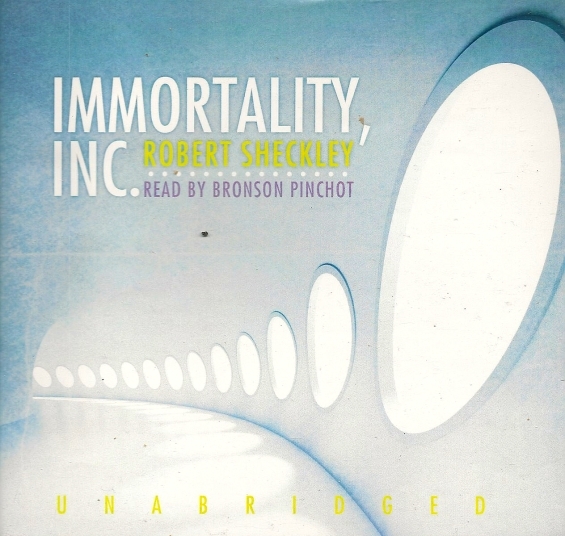 When I had the chance to listen to this audiobook, I jumped at it. I’ve always been a huge Monty Python fan, my brother can recite “The Holy Grail” word for word, thanks to me forcing him to watch it over and over. The kings of skit comedy and cross dressing were my favorites growing up, besides, once in a while on PBS (where I got my dose of Python in the 70s) they would have painted nudes in their cartoon art skits. Hey, I was in my early teens, and pre-teens, so I had to improvise. All that aside, the skit comedy from Monty Python’s Flying Circus was groundbreaking and led to many knockoffs from Saturday Night Live to The Kids in the Hall. The Python’s will always be king in my book. This collection from AudioGo is a nice grouping of an old LP that was originally released in 1970. (It even includes the “end of side one” commentary and references to people being on side one when on what would be side two.) The second part of this is that it also includes 4 episodes of “Fawlty Towers.” The John Cleese series that carried on a lot of the same comedy on BBC. I have to stop right here and shamefaced admit that I never watched “Fawlty Towers.” I’m not sure why, maybe because only one Python alum was in it and I never thought it would be good. I don’t know but after listening to this collection I find I was hugely mistaken. The episodes included here are a laugh-riot. The three hours I spent listening went by so fast that I have started it over. Is it wrong for my son and I to be singing “the Lumberjack Song,” while driving down the interstate? What makes these perfect is that they are made for or fine tuned to be the perfect group of audio comedy. 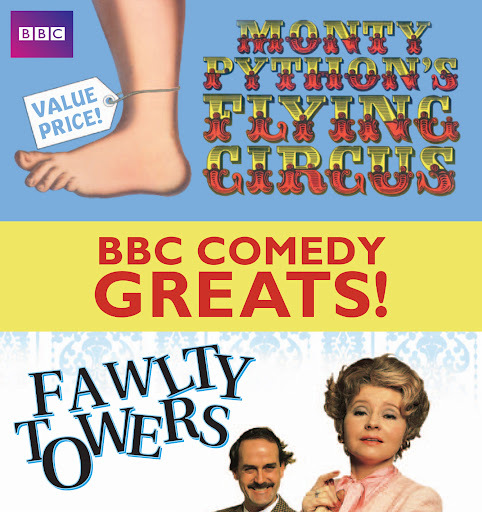 The Monty Python section of this 3 disc set is disc one and is one hour of some classic Python skits, such as; “The Lumberjack Song,” “The Dead Parrot Sketch,” “The Visitors,” “Nudge Nudge, Wink Wink,” “The Mattress Sketch,” and much more. So pick up this audio collection and get ready to laugh until your spleen bursts. Sounds great! We’ve painstaking transferred some of the old tapes and LPs of Python on to more modern forms of audio, but it sounds like this collection is the best bits. Young Adult fiction is one of those great genres that appeals to all ages, and can be a hit or miss. Recently the “Twilight” series of young adult vampire romance took the world by storm (hopefully that waste of time is over), before that there was Harry Potter and now “The Hunger Games” has been released as a movie. So the young adult fiction genre is one worth checking out, no matter your age. Many of the stories are extremely well written and just having the main characters as teenagers puts them in the YA category. While listening to this audiobook, I was (and still am) listening to another YA audiobook. This one is science fiction and the other is a Zombie Apocalypse YA book. So as you can see lots of directions you can go with this genre. This book is book two of the “Across the Universe” trilogy with the third book due (at the time of this posting) early 2013, so If you haven’t read the first one or listened to the audiobooks you still have some time so get going. Being the second book in the series there are some things that need to be stated to help you get caught up. The ship Godspeed is a multigenerational ship that has been sent on its 300 year mission to a planet that orbits the twin suns of Alpha Centauri. The crew consists of a group of people who have been set up in the ship with specific duties to keep the ship running generation after generation. The citizens of Godspeed are led by an Eldest who trains an Elder to rule the next generation. The ship’s main cargo consists of around a hundred or so people from various walks of life who are frozen in cryogenic chambers to be thawed upon arrival at Centauri Earth. There has been a bit of a mutiny in the Eldest/Elder community where one Elder is thought dead and a younger Elder is being trained to replace Elder. The missing Elder has taken the name Orion and started unthawing the “frozens.” Amy has been thawed out and joins Elder in solving the mystery of who is killing the frozens. Amy discovers that there are engine problems and that Godspeed may not arrive for another 50 years. Soon Orion is caught and frozen to be thawed and tried by the other “frozens” upon arrival at Centauri Earth. But not before it is revealed that the population of Godspeed have been controlled through drugs, and fooled for generations about the arrival at Centauri Earth. Here in book two, Amy now has settled with the fact she may never see her parents again (they are among the “frozens”) and has to start her life on Godspeed and decide if she is going to have a relationship with Elder. Elder is now in charge of the Godspeed, following the death of Eldest. He is determined to be different in his leadership style, no more lies and no more drugging his people. But rebellions begin rising up, laziness threatens food production, and there’s another murderer onboard. Meanwhile, Amy stumbles across a thread of clues left behind by Orion, explaining his extreme actions and revealing more secrets that will affect the entire ship, leaving Amy and maybe Elder with a choice to make. One of those secrets is that Godspeed is no longer moving through space, not merely moving slower than expected. This story mixes a coming-of-age type story with mystery, romance and adventure with some superb science-fiction. The science-fiction aspect should be the one that grabs you but with all the rest thrown in, it’s pretty hard to resist. Both teen and adult science fiction fans will enjoy this extraordinary coming-of-age story. 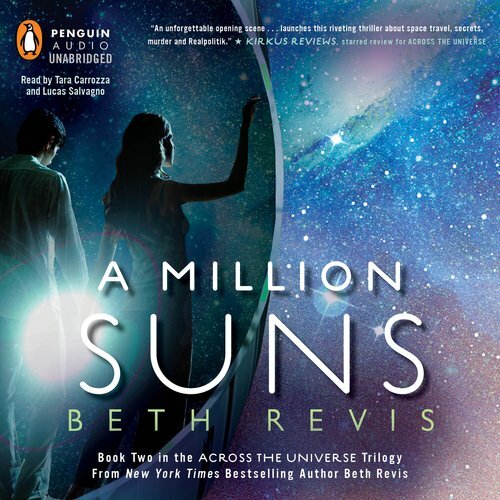 Filled with intense suspense, adventure, mystery, and a bit of romance – A Million Suns is pure excitement from beginning to its cliffhanger ending. This fantastic space opera trilogy is a must-read. The book is separated with each chapter told from the point of view of either Amy or Elder and the team of Tara Carrozza and Lucas Salvagno doing the reading the story flows perfectly. Each able to capture the main characters and all their personalities, as well as vary their voices well enough to still allow for the multiple character’s dialogues to be perfectly translated.